A 14-year-old Muslim boy became a sensation on social media Wednesday and got an invitation to the White House after word spread that he had been placed in handcuffs and suspended for coming to school with a homemade clock that teachers thought resembled a bomb. 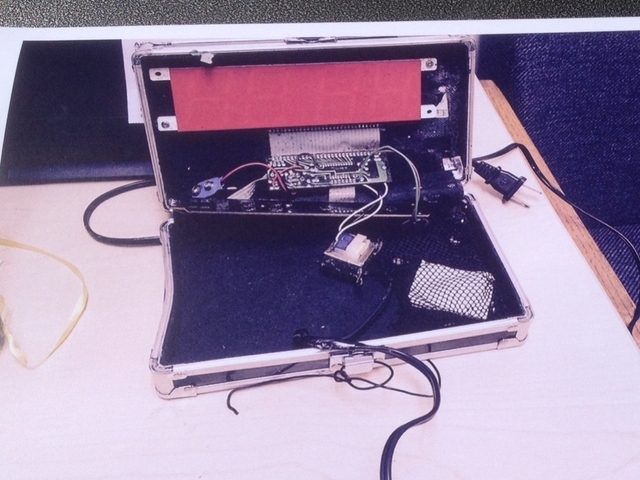 Irving Police Chief Larry Boyd said the clock looked "suspicious in nature," but there was no evidence the boy meant to cause alarm at school. Boyd considers the case closed. In a post to his site , Zuckerberg said, "Having the skill and ambition to build something cool should lead to applause." Ahmed's Sudanese father, Mohamed Elhassan Mohamed, said his son is a wizard at electronics, repairing the family's clocks, phones and electricity, and Ahmed said he has built a go-kart. He said he was moved by the support for his son from across the country. "I am grateful to the United States of America," he said, attributing the widespread support to "something that was touching the heart for everybody." Ahmed said he was suspended until Thursday. This spring, the city council endorsed one of several bills under discussion in the Texas Legislature that would forbid judges from rulings based on "foreign laws" --legislation opponents view as unnecessary and driven by anti-Muslim sentiment. Khalid Hamideh, a spokesman for the mosque the family attends, appealed for politicians "to be careful with the words that they use when they refer to Muslims, because this event is not an isolated event." "This all raises a red flag for us: how Irving's government entities are operating in the current climate," Alia Salem, executive director of the council's North Texas chapter, told the Dallas Morning News.